Accounting for all monies received by a landlord – including rent, late charges, and other fees – is very important not only from a business sense, but can be critically important in an Unlawful Detainer Cases based on non-payment of rent or breach of a provision in the rental agreement. While this is especially true in rent control areas like the City of Los Angeles, West Hollywood and the City of Santa Monica to name a few, it is also quite important in all other jurisdictions. What Is A Rent Ledger? The rent ledger is a written record, of everything the tenant has paid during his or her tenancy. It should start with the Security Deposit and other fees the tenant paid at the inception of the tenancy and should continue with an accounting of the date and amount of each month’s rent payment, and a separate entry for any late charges paid by the tenant according to he terms of the rental agreement. Why Do I Need A Rent Ledger/Rent Roll? Owing rental property is a business and should be treated like a business. Properly accounting for the monthly income of a business (rent and other fees for the rental property) is a sound accounting practice that is necessary for tax purposes and will be required if the landlord ever wants to evict a tenant for non-payment of rent or non-payment of late fees and other charges allowed by the rental agreement. How Do I Use A Rent Ledger In An Eviction Action? The rent ledger or rent roll is the backbone for any Unlawful Detainer action filled for non-payment of rent or non-payment of late charges and other fees allowed by the rental agreement. It is considered a business record under California Law and is admissible in a trial to prove the rent and other fees owed by the tenant. It is also a very helpful tool to refresh the memory of the manager or other witness when called to court to testify about the amount of rent claimed. However, that means that the rental agreement/rent roll must be kept regularly, usually each entry made when the payment has been received and in the normal course of the day to day operation of the rental property. To prevail in an Unlawful Detainer case for non-payment of rent the landlord must prove (1) ownership of the rental property; (2) the existence of a written or oral rental agreement that sets forth the monthly rent for the rental property, (3) the date of the breach of the rental agreement by failing to pay rent; (4) preparation and lawful service of a 3-Day Notice to Pay Rent or Quit that accurately sets forth the amount of rent owed. In a residential case if the amount of rent owed is overstated in the notice the landlord will lose that case. 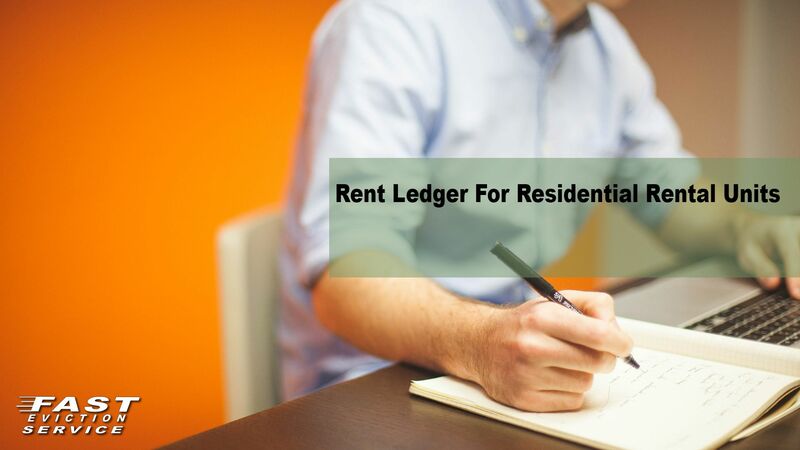 The rent ledger if properly prepared will be the most important tool in proving that the Notice to Pay Rent or Quit is accurate assuming that the landlord has done his or her job in keeping the rent ledger up to date.